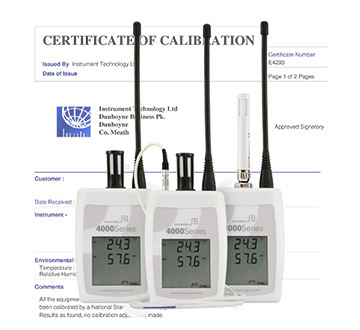 Calibrate.ie can calibrate your instruments to the manufacturer's original specifications or where required, to specifications provided by the customer. All calibrations are fully traceable to recognised national or international standards. Typical Instruments covered: Datalogging Systems, Hand Held Humidity Indicators, Humidity Transmitters, Digital Indicator with Probe, Humidity Loggers, Humidity Recorders and RH Transmitters. Humidity Range Covered: 10% to 95% RH. Hanwell RL4000RHT Temperature and Humidity logger The Hanwell RL4000 RH/T Series of accurate temperature and humidity sensors are available in data logger & radio transmitter formats.